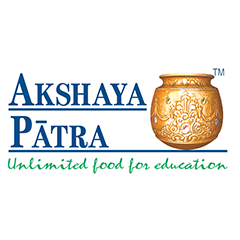 The Akshaya Patra Foundation is a not-for-profit organization that strives to eliminate classroom hunger by implementing the Mid-Day Meal Scheme in government schools and government-aided schools. Alongside, Akshaya Patra also aims at countering malnutrition and supporting the right to education of socio-economically disadvantaged children. Since 2000, Akshaya Patra has been concerting all its efforts towards providing fresh and nutritious meals to children on every single school day. With their optimum use of technology, they are serving wholesome food to over 1.76 million children from 15,024 schools across 12 states in India. Donate Rs. 100 To Akshaya Patra Foundation. Donate Rs. 200 To Akshaya Patra Foundation. Donate Rs. 500 To Akshaya Patra Foundation. Donate Rs. 1000 To Akshaya Patra Foundation. ● These vouchers are for donation purpose only. ● Voucher amount is directly donated to the Foundation. ● Users will need to contribute a minimum of Rs 500 (excluding magicpin points) to get tax deduction certificate from the Foundation. Such users should mail to care@magicpin.in with Name and Pan Number and will get the certificate within 10 business days.